The Heurich House is a grand Bavarian castle. WASHINGTON — Compared with the capital’s large national museums, these venues are small. While the district’s signature museums are imposing, these attractions are intimate. While the national museums tell the story of the American people, these house museums tell the stories of individual American people — politicians, merchants, brewers, art lovers. 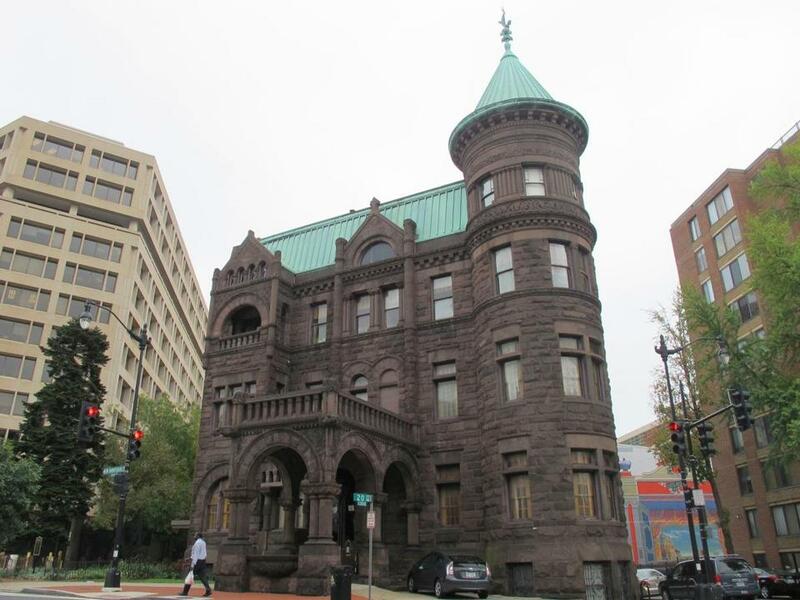 Together they make up the Historic House Museum Consortium of Metropolitan Washington, D.C., and provide a fascinating complement to the Smithsonian masterpieces. There are some 40 house museums in the consortium, which covers Washington, D.C., northern Virginia, and suburban Maryland. All are open to the public and are either free or charge a nominal admission fee. On a weekend visit to D.C., we checked out four: an elegant home built for an ambitious Virginia politician that ended up sheltering the President and First Lady for a time in 1814; a Neoclassical mansion built by a granddaughter of Martha Washington that preserves the artifacts of six generations; a grand stone castle that was the home of the capital’s premier brewer for 50 years; and an elegant estate filled with Russian and French art. The unusual shape of the Octagon (technically it has eight sides, but it’s not a “regular” octagon) derives from the odd-shaped parcel of land where William Thornton, architect of the Capitol, built a winter home for Virginia politician John Tayloe III in 1801. In the foyer a map of the city at the time shows three buildings: the Capitol, the White House, and the Octagon. When the British burned Washington in 1814, President James and Dolly Madison took up temporary residence here. On the second floor is the round “Treaty Room,” so named because it was here that President Madison signed the Treaty of Ghent, ending the War of 1812. The stone basement with brick floors contains servants’ quarters and a wine cellar. In 1902 the American Institute of Architects bought the building for its new national headquarters, initiating a series of state-of-the-art restorations. At the center of Tudor Place, also designed by William Thornton, is a temple portico, a glassed-in full circle anchored by stately columns, that extends the soaring foyer into the landscaped grounds. Completed in 1816, Tudor Place has two claims to fame, our guide, Ken Peters, said. It has the second-largest collection of items that belonged to George Washington (after Mount Vernon), and virtually every artifact in the house — furniture, artwork, china, silver — is original and was used by the six generations who lived here. We saw one of two surviving camp stools belonging to Washington (the other is in the Smithsonian) and an original letter from George to Martha dated June 18, 1775. The servants’ quarters seemed right out of Downton Abbey, with a long table, shoe shine station, and a bell call system on the wall. Hillwood Estate, Museum & Gardens, once the home of cereal heiress Marjorie Merriweather Post, is a 36-room Georgian mansion set on 13 acres of formal gardens. From the beginning the house was intended to be a museum displaying the extraordinary art collection of its owner. Post traveled frequently to Russia with her third husband, Joseph Davies, American ambassador to the Soviet Union from 1936 to 1938, and Hillwood’s Russian art collection — including some 90 Fabergé works, porcelain, glassware, and ornate religious icons — is extraordinary. Post’s other love was French decorative arts, and the collection includes tapestries from the famed Gobelins factory, furnishings, and Sèvres porcelain. The gardens, particularly a Japanese-style garden with millstones and bridges crossing pools of water, invite reflection. “People really welcome an opportunity for respite and renewal, and they find that at Hillwood,” said Angie Dodson, director of learning and engagement. There’s also a terrific and reasonably priced cafe on site. Other house museums in the consortium celebrate abolitionists, suffragettes, and generals, with architectural styles ranging from Colonial to urban row houses to Frank Lloyd Wright. For more information visit dchousemuseums.org. Ellen Albanese may be reached at ellen.albanese@gmail.com.